If, as we all freely accept, the meaning of life is 42, what does that make 43? A miscalculation, and a life led in the belief that it was correct, all for the best, but was in actual fact all very wrong and completely missing the point? A self-deluding over-estimation of the value of one’s own contribution to society? Such, and other, considerations have kept us busy since the the 2018 smow blog #campustour formally ended……. The lead headline from the 2018 #campustour is that although our falafel:school ratio improved greatly, we didn’t quite make the 1:2 we were aiming for. And failed by one and half falafel. A falafel and a half!!! And we know where they were/are. And as so often in our biographies it comes down to Chemnitz and Berlin. Specifically Berlin-Charlottenburg. 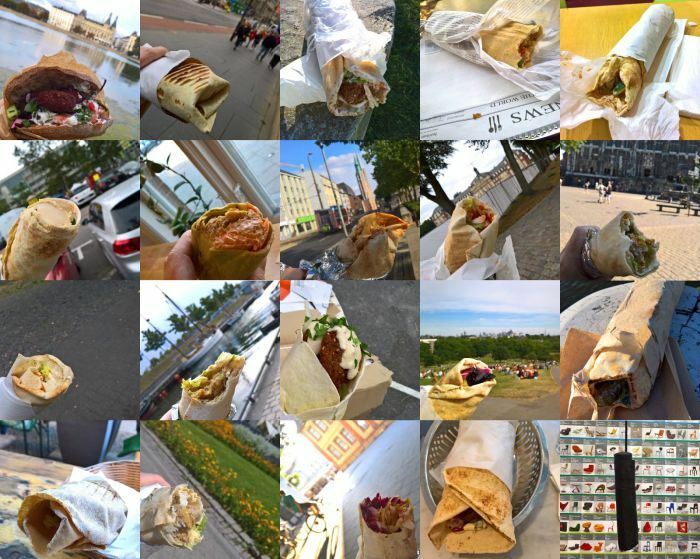 Ahead of our visits to both the Handwerskammer Chemnitz Unikate 7 and the Universtät der Künste Berlin Rundgang exhibitions we were clear where we would go, knew falafel dealers local to the two institutions whose craft we were familiar with, enjoy and trust. And both of whom were no longer there!!! In both cases we found ourselves in front of a falafelless foodmonger. The timing was so tight in Chemnitz that we simply had no opportunity to search for an alternative, we had a train to catch, and in Berlin the cards were also stacked hopelessly against us. But that would have been the two. There was admittedly also the Den Haag/Rotterdam fiasco, where we missed out on two 100% gold certain falafel through that majestic idiocy that occupies the place in our characters where ambition and desire reside within others. Completely our fault. And would also have been the two. And while we could blame the rules, we won’t. Article 4 (f) of the #campustour regulations states that “where two or more schools are visited in one location on one day only one falafel can be included in the tally”, thus denying us two (theoretical) London falafel. But we knew the rules before we set off, accepted them and can’t cry foul after the fact. Still irks. A falafel and a half!!! Not all thought provoking moments were at design schools… Palissade by Ronan & Erwan Bouroullec through HAY at the Statens Museum for Kunst Copenhagen. 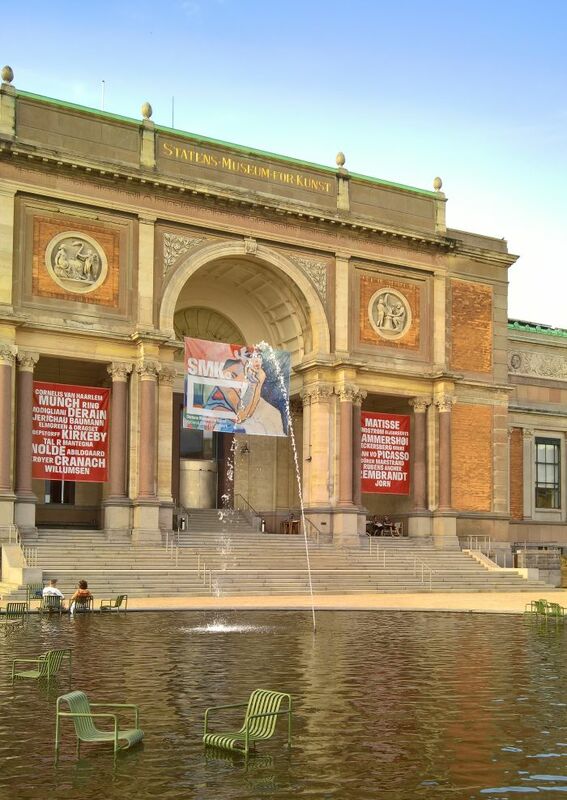 Couldn’t do that with Copenhague chairs…… Ironically. While 43 sounds like a lot of design schools, in reality we barely scraped the surface of European design education. The list of schools which a lack of time or calender clashes meant we couldn’t visit is long, as is the list of countries we didn’t visit. For although visiting 7 countries, 6 for the heretics who believe Scotland and England to be one and the same, they were essentially all in northwest Europe. Or put another way, weren’t Italy, Spain, Portugal, Hungary, Greece, etc. And even within the northwest we didn’t visit France, Belgium, Austria, Norway, Poland, Finland…..
We barley scraped the surface. And therefore wasted our time? One of the genuine joys of design is that there is no one correct answer to any given question, design, even as expressed by something apparently as unequivocal as a chair, is in many regards nothing more than considerations on a question. Normally however one is presented with design realised not only within the context of the designer’s approach to answering that question, but also external factors, including, for example, the subjective understanding of a gallery/festival curator, or a manufacturer’s belief in the commercial viability of a project. Projects at design schools exist without such filters. Or at least should. And therefore allow for a wider spectrum of insights into how a question could be approached. Or at least should. And that (ideally) in context of contemporary social, cultural, technical, ecological, political, economic and material understandings, as well as contemporary reflections on design history. And thereby allowing for a reassessment, evolution of your own position to and understanding of design. And that every project is different, every design school different, either you’ve seen everything or you’ve barely scrapped the surface. There ain’t no middle ground. In fact there ain’t no ground, it is an ongoing process in constant flux. And so it don’t matter where you start or end, important is to be submerged. Not that one should let your thoughts on design be guided by students alone. That would be lunacy. However alongside new commercial products presented at trade fairs, experimental/research projects presented at galleries/festivals and reflections on conversations with designers/architects, student projects and design school research represent an important contribution to any meaningful considerations and discourse on design. Which is why we always encourage you all to visit your local design school exhibitions, there are few more pleasurable ways to advance, evolve and deepen your understanding of design, its contemporary context and relevance. And indeed question afresh what is “design”? How did our understanding evolve in the course of the tour? That is a subject for later posts, however by way of a spoiler/teaser we’ve never read the word “Millennials” in context of design projects as often as we have in the past few weeks. Nor “Fake News”. And yes, we have opinions on both. 15, from whom can claim a Hanseatic League connection. Such a high percentage wasn’t planned, was however perhaps unavoidable, the Hanseatic League being just as broadly spread and widely travelled an institution as smow is. 5, most design schools visited in one city. London: The CASS, The Royal College of Art, Central Saint Martins, Chelsea College of Arts, Architectural Association School of Architecture. 5, number of currencies with which we paid for our falafel, or 4 for all those heretics who think Scottish pounds sterling English pounds sterling are one and the same. 11, number of train operating companies used. 210, minutes, longest train delay. On a journey from Leipzig to Aachen, and such a long delay we never made it to Aachen that day but were forced into an unscheduled overnight stop in Cologne. 0.90, Euro, the cheapest public transport fair paid. From Hildesheim Hbf to Hildesheim Ost. One stop. Three minutes. 4.90, Euro, the most outrageous public transport fare paid. From Frankfurt to Offenbach. Two stops. Eleven minutes. And then another 4.90 to get back from Offenbach to Frankfurt. That’s more expensive than Switzerland!! 2019, #campustour? The honest answer is ??? Not because the flesh or mind is weak, but on account of as yet unknown political developments. As all familiar with the peculiar manner by which this blog is produced will appreciate, from April 2019 onwards the smow blog could be severely limited in its movements. The improbable fantasies of a group of populist nationalistic islanders and their narrow view of the United Kingdom’s place in contemporary Europe, that and an irrational hatred on the European Court of Justice, could see us having to focus on design stories from the Kingdoms of Scotland, England, Wales and Ulster. And so its wait and see, but if we are allowed to roam freely through Europe we will certainly make like Willie Nelson on the search for adventures, design and falafel.